material based on format (books, articles, websites, etc.). This article provides an overview of these types of resources along with some commonly used references. The mention of any particular reference is not intended as an official endorsement, but simply recognition of its common use. Pharmacies should be aware of any requirements made of them with respect to reference materials, both to avoid any citations for noncompliance and in order to provide an appropriate level of assurance that they are providing proper medication therapy. On the federal level, there are currently no specified requirements for pharmaceutical references. The federal government has opted to leave these requirements up to each state. The United State Pharmacopeia and National Formulary (USP-NF, also commonly referred to simply as USP) is a publication about prescriptions and over-the-counter medicines and other healthcare products sold in the United States. 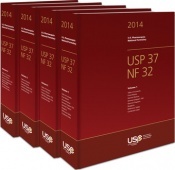 Pharmacies and pharmaceutical manufacturers are required to follow the standards in the USP-NF. The USP also sets standards for food ingredients and dietary supplements. Chapters in the USP that are listed as below 1000 are considered enforceable, while chapters enumerated as 1000 or greater are considered guidelines. 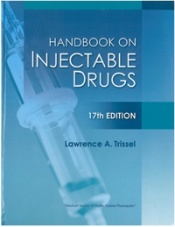 Therefore, USP <797> Pharmaceutical Compounding-Sterile Preparations and USP <795> Pharmaceutical Compounding-Nonsterile Preparations are considered enforceable, while USP <1075> Good Compounding Practices and USP <1160> Pharmaceutical Calculations in Prescription Compounding are simply considered guidelines for best practices. A challenge to enforcement is that the USP does not have its own enforcement body. Enforcement of various regulations is left to the Food and Drug Administration, The Joint Commission, and individual state boards of pharmacy. This means that many regulations may not be enforced in some states and territories. States, as would be expected have a wide variety of requirements, depending on which state you are in, and what kind of practice setting you are in (community, institutional, mail order, etc.). To let's look at the reference requirements for Pennsylvania and California in order to get an idea of what states require. (i) Enables a pharmacy to prepare and dispense prescriptions properly, consistent with its scope of practice. (ii) Includes reference sources appropriate to the type of pharmacy practice at that particular location. A pharmacy shall include in the pharmacy’s library current material regarding the technical, clinical and professional aspects of practice with emphasis in the area in which the pharmacy specializes. (iii) Enables the pharmacist to compound medications in a safe and effective manner consistent with accepted standards of pharmacy practice. (iv) Lists the possible drug interactions and possible adverse effects of medications dispensed by the pharmacy. (v) Lists the therapeutic equivalents for medications. (vi) Lists the therapeutic usage and dosages of medications dispensed by the pharmacy. (vii) Provides guidelines for the counseling of patients. (viii) A pharmacy that specializes in nuclear or parenteral prescriptions may limit the library it maintains under subparagraph (ii) relating to the pharmacy’s own specialization. (ix) Maintains the latest editions including current supplements of each of its reference sources. 1751.8. Sterile Injectable Compounding Reference Materials. In any pharmacy engaged in compounding sterile injectable drug products, there shall be current and appropriate reference materials regarding the compounding of sterile injectable products located in or immediately available to the pharmacy. Whichever state(s) your pharmacy is practicing in, make sure your pharmacy is in compliance. Scholarly fields, such as pharmacy, requires much research, means for cataloging/indexing the research, and eventually compilations from the various research studies. All aspects should involve competent professionals capable of properly interpreting the information. Primary literature provides direct access to the most current information resulting from contemporary research. It is the largest and most current source of information. This type of literature includes original reports of scientific, clinical, technological, and administrative research projects and studies. 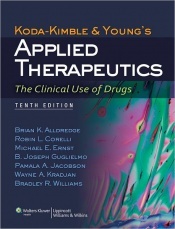 Examples of primary pharmacy literature includes peer reviewed journals such as the New England Journal of Medicine (http://www.nejm.org), the American Journal of Health-System Pharmacy (http://www.ajhp.org), and the International Journal of Pharmaceutical Compounding (http://www.ijpc.com). 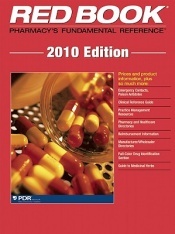 For additional pharmacy journals, a list of popular pharmacy journals can be found at http://www.pharmacy.org/journal.html. Secondary literature involves the interpretation and evaluation of information derived from or in reference to the primary literature sources. This secondary literature takes the primary literature and synthesizes, generalizes, and integrates new research. Examples of secondary literature includes review articles, systematic reviews, meta-analyses and reference works. Secondary literature also includes indexing and abstracting services. PubMed (http://www.ncbi.nlm.nih.gov/pubmed) and The Cochrane Library (http://www.thecochranelibrary.com) are common examples of secondary literature. Tertiary literature references are condensed works based on primary and secondary literature, such as textbooks, encyclopedia articles, and guidebooks or handbooks. The purpose of tertiary literature is to provide an overview of key research findings and an introduction to principles and practices. These are the types of references most commonly used in both the classroom and pharmacy environment. 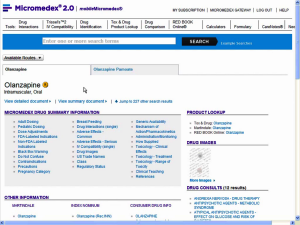 Some common examples of these are the Drug Information Handbook (http://webstore.lexi.com/Drug-Information-Handbook), Micromedex (http://www.micromedex.com), and Drug Facts and Comparisons (http://www.factsandcomparisons.com). Depending on the types of information specifically needed, along with accessibility and individual preference, a particular format or specific resource may be better suited. With that in mind there are numerous books, websites, and dedicated applications to help ensure that professional have access to the necessary information. The listing below are not intended to be exhaustive, but simply to detail some of the more commonly used references. Print references usually offer some reasonable advantages over other types of media in that they are available off-line, relatively easy to navigate, and a format that most people are comfortable using. Conversely, a disadvantage is that most of them are limited to annual updates (although some publish monthly updates that would need to be inserted). In a dynamic field like pharmacy this can be a concern. As you read through the list, you will find it very common that many of the books listed offer varios electronic tools/versions (eBooks, web sites, mobile apps, and database integration). 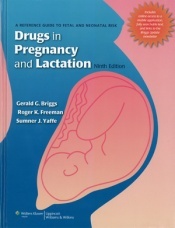 Some of the books listed below are very broad in subject matter (Drug Facts and Comparisons) while others are more specialized in their content (Drugs in Pregnancy and Lactation). As previously mentioned, any references listed are not intended as recommendations, but are simply being highlighted because they are commonly used. The Drug Facts and Comparisons also provides information on manufacturers' phone numbers and diagnostic aids. The print version can receive monthly updates to ensure current content. There is also an online version of this available as a subscription service. 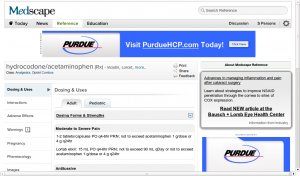 The online version is discussed further in the online drug information resource section. The AHFS Drug information is broken into sections divided by drug classifications. The print version is updated annually with a new edition. It is also available through online subscription and through specific apps for Android and iOS. The Physician's Desk Reference effectively prints the information approved by the FDA for the package insert. The PDR is also available online at http://www.pdr.net, and for various smartphones and tablets (Android, BlackBerry, and iOS). 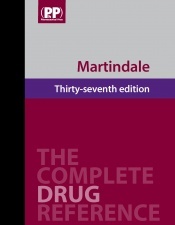 Besides pharmaceuticals, the Martindale also covers herbals, diagnostic agents, radiopharmaceuticals, pharmaceutical excipients, toxins, and poisons. 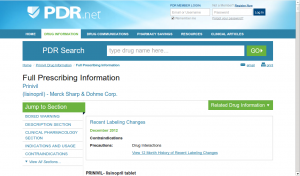 The Drug Information Handbook is updated annually and is conveniently organized alphabetically by generic drug names with cross-references from common brand names. It is also available as an app for Android, BlackBerry, and iOS. 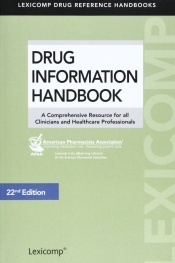 The publisher of the Drug Information Handbook, Lexicomp, also provides an online version at http://online.lexi.com. This is highly detailed therapeutic text is available in both a traditional printed format and as an ebook. 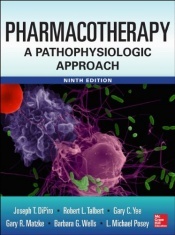 The information in this textbook is often provided through the use of case studies in the attempt to provide demonstrative examples of patient care and the challenges associated therein. 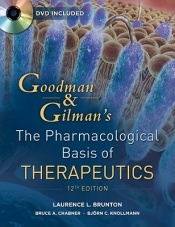 Goodman and Gilman's Pharmacological Basis of Therapeutics is the "Gold Standard" for pharmacology textbooks; although, it is deficient on information for clinical application. This is available as both a printed book and as an ebook. Some concern has been expressed over the legibility of the charts and tables contained within the ebook version. manufacturers telephone numbers and addresses. This product is also available on CDROM for MS Windows and an online version is available as well. The Red Book can be integrated into the Micromedex online subscription service as both products are available through Truven Health Analytics. While the various electronic versions have continued to receive updates, the print edition has not been updated since 2010. The information from this product is available in multiple formats including print, online via a subscription, and for mobile devices including Android and iOS. This product can also be integrated into the online version of Facts and Comparisons. charts for every medication that provide easy view of the information. This product is available in an array of formats including a loose leaf print edition that receives quarterly updates, various mobile devices including Android and iOS, online, and it can be integrated into other pharmacy databases. Wall charts of information from this publication are also available to help with many common stability and compatibility questions. lists of drugs contraindicated in pregnancy. This book is available in traditional print and in various eBook formats. A companion website aids in keeping information current and adds another level of search capabilities. The book also comes with a free mobile app that has limited functionality, but can be upgraded from within the app. This publication is typically updated every two years. Hale Publishing also maintains an online database with this information as a subscription service available for both individual and institutional subscriptions. Of the approximately 313,000,000 people living in the United States, over 245,000,000 use the internet. Many of these Americans regularly use the internet to research health related information with an over abundance of sites offering medical information. If someone does a general online search for the word “cancer”, a voluminous number of results will appear in the results (about 181,000,000). With this high degree of information accessibility, brief lists of the 'Pros & Cons' can be made for looking up health care information via the internet. Easy and nearly instantaneous access to information. Lots of information from a variety of sources is available. The internet is always open/on (no office hours). Provides the ability to look-up information on potentially embarrassing subjects with a perceived degree of anonymity. Voluminous quantities of information can be difficult to sift through. Not all information on the web is from reputable sources. Search engine may return biased results. It may be difficult to determine the difference between search results and paid advertisements. As we move forward in this article, we will look for ways to manage some of these 'cons'. When evaluating online resources it is useful for sites to follow best practices as described by Healthcare On the Net (HON), but if all these policies are not necessarily in place there are also 'red flags' to warn you of inappropriate information. Health On the Net (HON) provides 8 principles for its code of conduct for medical and health related web sites. These principles are commonly identified as best practices. Listed below are their 8 principles. There are a number of free and subscription based web sites available for health care professionals, particularly for pharmacists and pharmacy technicians. In this article we will once again focus on resources commonly used by pharmacy students and professionals. A particular site being listed in this article is not necessarily a particular endorsement for a web site, but is instead a recognition of its frequent use. By free, this only implies that it requires no monetary remuneration by individual users. Some of these sites require free registration, and most also include advertising to cover their costs. 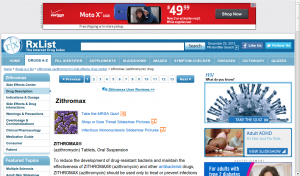 Medscape also provides a mobile app both Android and iOS. 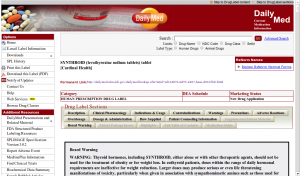 DailyMed - http://dailymed.nlm.nih.gov/ - is a website operated by the U.S. National Library of Medicine (NLM) to publish up-to-date and accurate labels (package insert) for health care providers and the general public. The contents of DailyMed is provided and updated daily by the U.S. Food and Drug Administration (FDA). 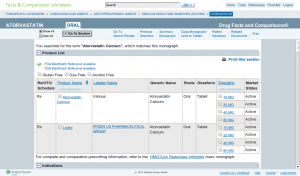 The FDA in turn collects this information from the pharmaceutical industry. As of January 3rd, 2014 it contains 58,383 package inserts (23,490 prescription labels, 26,780 OTC labels, 4,932 homeopathic labels, 1,646 animal labels, and 1,535 labels for bulk ingredients, vaccines, and some medical devices). 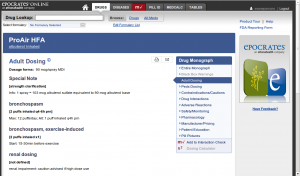 DailyMed also provides an RSS for updated drug information. 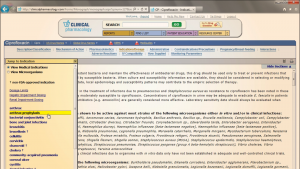 access to articles on various clinical trials. There are also PDR apps available for Android and iOS. Drugs.com has both paid for and free apps available for Android and iOS. Epocrates has also had apps available for most mobile platforms. Subscription sites do offer some advantages when compared to free websites. There is a general perception that these subscription websites offer more information. There is a commonly held belief that they are less likely to inappropriately bias individuals through advertising since ads are not included in search results. Also, there is generally the ability to subscribe to additional databases that may be useful to your facility based on the kinds of patients that are being served. These subscription sites usually require contracts which are based on various items including corporate vs individual user licenses, the number of people that will be provided direct access to the program, educational rates compared to rates for healthcare facilities. As these rates can be complex to determine, specific costs will not be discussed in this article. The four subscription websites (Micromedex, Facts and Comparisons eAnswers, Lexicomp Online, and Clinical Pharmacology) mentioned in this article are among the most commonly used drug information subscription services. links to drug class overviews. 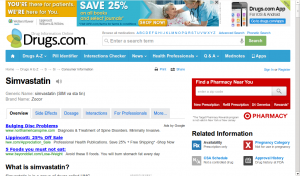 Pharmacist's Letter and Natural Medicines Comprehensive Database. The Consumer and Patient Health Information Section (CAPHIS) of MLA evaluates websites based on the following criteria: credibility, sponsorship/authorship, content, audience, currency, disclosure, purpose, links, design, interactivity, and disclaimers. Whether your preferred search engine is Google, Yahoo!, Bing, or DuckDuckGo none of them identify relevant information perfectly, because each employs different search criteria. Also, most of these engines may prioritize information based on ad revenue, information that may be beneficial to a particular company, or even based on your profile from past searches. When desiring a comprehensive search, many users turn to meta-search engines that employ multiple engines simultaneously. Searches conducted by a meta-search engine will include results from multiple search engines (typically, Google, Yahoo!, Bing, and Yandex). Some popular meta-search engines include Dogpile (http://www.dogpile.com), My Excite (http://www.excite.com), HotBot (http://www.hotbot.com), and Info.com (http://info.com). In the constantly connected world of today, we are often inundated with broadcast emails, texts, and tweets on urban health myths warning of imminent health threats. About.com (http://urbanlegends.about.com/library/blxhealth.htm), the CDC (http://www.cdc.gov/hoaxes_rumors.html) and Snopes (http://www.snopes.com/medical/ and http://www.snopes.com/politics/medical/) all maintain websites exposing health-related hoaxes and rumors which may be useful not just to ensure that healthcare professionals have access to the correct information, but so these professionals can direct others to them as well. Smartphones and tablets have become an increasingly common means for people to receive and interact with data due to their easy portability, high speed internet connectivity, and large array of applications for the most popular platforms. While numerous mobile operating systems are available on the market today (Android, iOS, Blackberry, Windows, Ubuntu, FirefoxOS, Tizen, Jolla, etc. ), the dominant players are Android (used in Nexus, Galaxy, Kindle Fire, etc.) and iOS (used in iPhone, iPad, and iPod Touch). 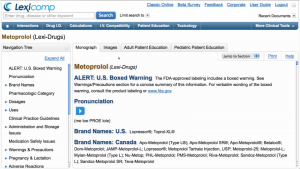 Various drug information resources have been made available with dedicated apps (short for applications) to be used with the more common operating systems. While hundreds of healthcare related apps have been created for these platforms, this article intends to focus on the ones that are frequently used by pharmacists and pharmacy technicians. This app is free (registration required) and is available for both Android (including Kindle Fire) and iOS. This app is available for both Android and iOS mobile devices. This app is available for both Android and iOS. The core of this application is available as a free download, but various upgrades are available for this app as well which do require purchase. After the 30-day trial, users can choose from a range of available databases that they wish to continue to access for varying costs. This app is available for both Android and iOS. Sigler Drug Cards app is expected to include a quiz in the next iteration of their software. This is currently only available as a paid for app. daily drug news and alerts. This is a free app available for both Android and iOS. This is a free application available to both Android and iOS. Sometimes a disease or condition is given a name related to either the individual(s) to first diagnose a disease or its causality (i.e., Alzheimer's disease), or a famous individual that had/has a disease (i.e., Lou Gehrig's disease). Eponyms provides a short description of more than 1,700 common medical eponyms. A simple tool to quickly look up the meaning of many eponyms. It uses the beautiful eponym database from Andrew Yee (http://www.eponyms.net/), and updates can be installed right from within the application. Eponyms is a free app available to both Android and iOS. 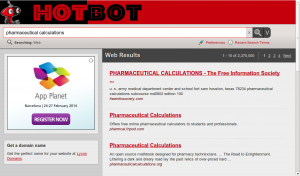 RxDrugs: Comprehensive information on thousands of brands and generics, with interactions (including multi-drug analyzer tool), pill images and over 400 integrated dosing calculators. 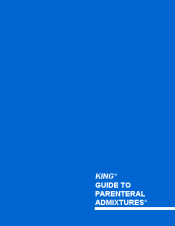 This resource also includes formulary information covering 5,000 health plans in all 50 US states. Archimedes: Medical calculator with more than 200 interactive tools, organized by specialty. Outlines in Clinical Medicine: Evidence-based clinical information on hundreds of diseases and symptom-related topics, presented in convenient outline format. MedAlert™: In-context and specialty-focused journal summaries, trial results, breaking clinical news, drug alerts and other information, fully integrated with the app’s global search and SmartLink. This product is available for both Android and iOS. Medical libraries contain many references and journals that you can peruse and even check out. The library staff have been trained to assist people in searching for specialized materials. Additional information for online resources can be found on the Medical Library Association's website at http://www.mlanet.org/resources/. IMedicalApps (http://www.imedicalapps.com/) is an up to date resource for medical software for smartphones and tablets running an array of mobile operating systems. This page was last modified on 8 February 2014, at 15:18. This page has been accessed 346,885 times.